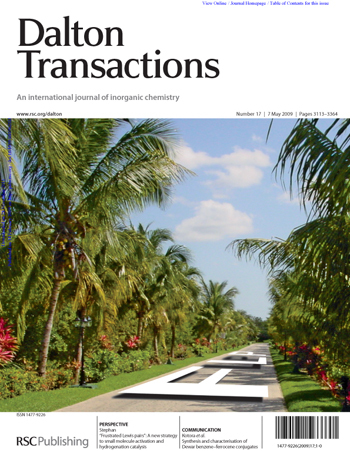 We are pleased to announce an upcoming themed issue on Frustrated Lewis Pairs, guest edited by Doug Stephan. It is our pleasure to invite you to contribute to this themed issue. The concept of Frustrated Lewis Pairs (FLPs) was formulated in 2006/2007. Since then, an explosive array of creative applications in stoichiometric and catalytic reactivity have been developed based on this simple concept. Activation of a variety of small molecules has garnered much interest and utility in fields including metal-free hydrogenations, green-house gas chemistry, hydrogen storage and organic synthesis have also emerged. A number of these systems have prompted insightful computational studies targeting a deeper understanding of this novel reactivity. Moreover the notion of FLPs has broadened well beyond the initial phosphine/borane systems, with extensions to a variety of main group and transition metal systems as well as organic reagents. This themed issue aims to grasp the current momentum in FLP chemistry and hopes to bring together contributions from experts across the field. How to submit? All types of manuscript, Communications, Full Papers and Perspectives, will be considered for publication. We aim to publish this themed issue in summer 2012 and therefore would like to receive manuscripts by 16th February 2012. The manuscript should be prepared according to the format for regular articles and should be submitted via our online system. All invited manuscripts will be subjected to the normal refereeing procedure. Deadline for Submission: 16th February 2012. Please indicate on submission that your manuscript is intended for this themed issue and direct any questions to the Dalton Transactions Editorial Office.